In my previous entry, I wrote about the five-day road trip from Brussels to Portugal. Algarve was our last stop in that very hectic schedule. All I could remember in the 4 days in Algarve was the food experience. THIS was what I call a VACATION. We were very relaxed, we did not site-see and we did not have an exact schedule to do anything but eat. The beauty of being with a local is they know where to buy the good stuff. My Aunt, who we stayed with in Portugal, was an expert on food and drink. We basically just followed whatever she suggested us to eat. #1. MARUFO 1 in Quarteira, Algarve is a restaurant that serves Piri piri Chicken, Sardines, steak and Whiskey Tartar without the tourist rates. (It was 80 Euros for 5 people) This is where locals go to eat. We had to try what Portugal is famous for, the SARDINIAS. It is incomparable to ones we have in the Philippines that come in bottles. 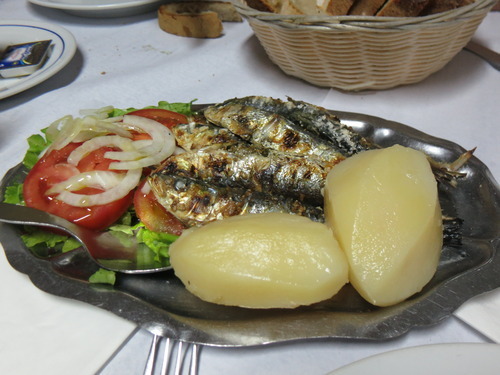 These were gigantic and was cooked only with salt and served with tomatoes, onions, and potatoes. It tasted amazing! 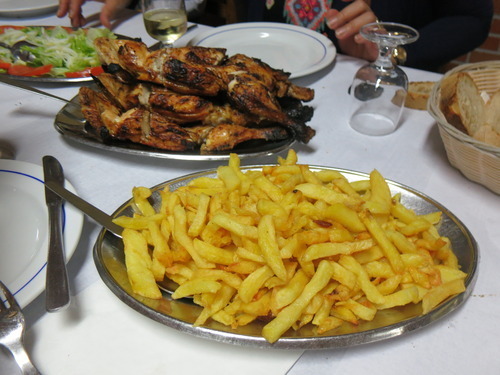 Together with the Sardinias was the “FRANGO” (Portuguese for Chicken) served with fries. Order these two and you’re good to go.